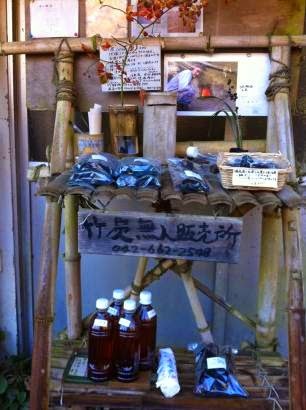 A variation on the chokubaijo (vegetable stand). Instead of produce, homemade charcoal. There's good reason for charcoal to be so popular in Japan. A long tradition of using it to heat and cook made it indispensable for a smooth running household, but it played other roles inside and outside the home. A charcoal maker would have gathered their raw material – wood – from nearby forests, which meant they played a significant role in the cycle of satoyama. The stump left behind in this half-wild, half-managed 'buffer' area would resprout in preparation for future harvests. Such practices allowed for continuous human use that left a place for understory plants to flourish and wildlife to roam. Today, only a small handful of charcoal-makers remain, but the country's fondness for this dark material remains steadfast for other reasons. Japanese friends recall visits to their grandparents homes where it was customary to find a small bowl of charcoal could be found in corners of the kitchen or restroom or even tucked away inside the refrigerator and closets. Bringing nature into the house as a natural deodorizer and dehumidifier becomes custom then, one that most people here hardly give a second thought. One thing that makes Japanese charcoal unique and therefore still revered is how it is made. Wood from bamboo or hardwood trees (or ume seeds even in the case of Sanyo Paper!) is heated to a very high temperature – about 1,000 degrees Celsius – and then allowed to cool in an oxygen-free environment. The end result is a charcoal that gives off little smoke (hence, perfect for the izakaya or for use in the tea ceremony), while generating heat strong enough for cooking. Such high temperatures also create what is called 'activated charcoal.' This type of charcoal has a very porous surface area attractive to other molecules, like those from yesterday's fish, floating by. Charcoal's normally bottleneck-shaped pores are widened out by the heating process, subsequently making it easy for wandering molecules to land. Irresistibly drawn in, such molecules find themselves so busy settling on the surface (a process called adsorption) that they have no energy left to roam about the house being smelly or making mildew. How much surface area could such a small thing possibly have? According to Professor Teresa Bandosz, Professor of Chemistry and Chemical Engineering at The City College of New York who studies the use of activated carbon to help solve environmental problems, one gram of activated carbon (in this case, charcoal) has a surface area of 1,000 to 3,000 square meters. “Think of a sponge with its many holes. Activated carbon is like that sponge, but rigid with walls made of carbon. The layers are arranged in a disorganized way and between them are the pores. If you unfold the layers and lay them out flat like tiles on a floor, the surface is immense,” said Bandosz. That irresistible draw is not just because activated charcoal has so much elbow room for molecules to land on, but the fact that it is carbon. Carbon can occur by itself as an element or nearly pure as diamonds or coal, but it is most commonly found combined with other elements to form things such as animals, plants and the soil they grow in, as well as, human beings. Essentially, every living thing and then some, contains carbon. And that also includes those odors emanating from the garbage bin or the now unrecognizable leftovers in the back of the refrigerator. What does that have to do with activated charcoal? Carbon, essentially, likes carbon. “The carbon surface (of charcoal) is able to attract molecules that have carbon. Organic species are made of carbon, so there is a higher affinity and physical attraction,” said Professor Bandosz. The next logical question is what happens when all the space on that massive surface area is full? It gets emptied, of course! Another benefit of activated charcoal is its ability to be reused. Heating the charcoal will cause the bonds with those offending molecules to loosen and ultimately release the majority of the attached molecules through evaporation. (Odor molecules tend to be gaseous, so a little heat makes them relax their grip and break free.) While the organizations Professor Bandosz works with regenerate their carbon on an industrial scale at temperatures ranging from 500 degrees Celsius to 800 degrees Celsius, the average person can achieve a somewhat similar effect by hanging their bag of charcoal in strong sunlight for a day. A regular airing every few months means activated charcoal can remain useful for a year or two before needing to be replaced. Bringing this idea into the home is simple whether it's lining drawers with charcoal paper, hanging charcoal sachets in the closet, or inserting some of either of those into a rain-soaked shoe. A little bag of it on the table or in the back of the refrigerator can work wonders, and let's not forget that the Ekberg's placed a sturdy layer of charcoal lining under the floor as part of their eco-remodel, too!